SIGNED KIU TAI YU, OO/20, 2000. Rhodium self-winding movement with 18K rotor and special escapment, the balance bridge attached to the dial, black lackered dial with aperture for escapment, eccentric dial on gold cartouche with Arabic, Roman and Chinese numerals, blued steel hands, circular case with down turned lugs, crown guard, glazed back secured by six screws with enamel decoration and enamel cartouche signed Kiu Tai Yu in the band, maker's 18ct white gold and enamel buckle, dial, case and movement signed. Born in China in 1946 Kiu Tai Yu made his first mechanical watch at the age of 23. In 1978 he made his first escapement without pallets. Two years later, in 1980, Kiu Tai Yu moved to Hong Kong where he opened his shop Kew & Cie where he deals in fine wrist and pocket watches as well as clocks. Mr Kiu is the author of the acclaimed book Time in Pocket which was adopted by a Swiss watchmaking school as a standard reference work. In 1991 Kiu Tai Yu created his first Tourbillon wristwatch and has now created a total of 16 pieces. Mr Kiu is credited with creating the third generation Tourbillon "Kiu's Mystery Tourbillon" which has been published in several books on Twentieth Century watchmaking. In 2000 Mr Kiu created a limited edition watch with escapement visible through the dial, these watches were sold strictly in Asia. At this year's Basel fair Kew & Cie released their first commercially available wristwatch. This lot is sold with fitted box and an extensive file of documents related to Mr Kiu Tai Yu. 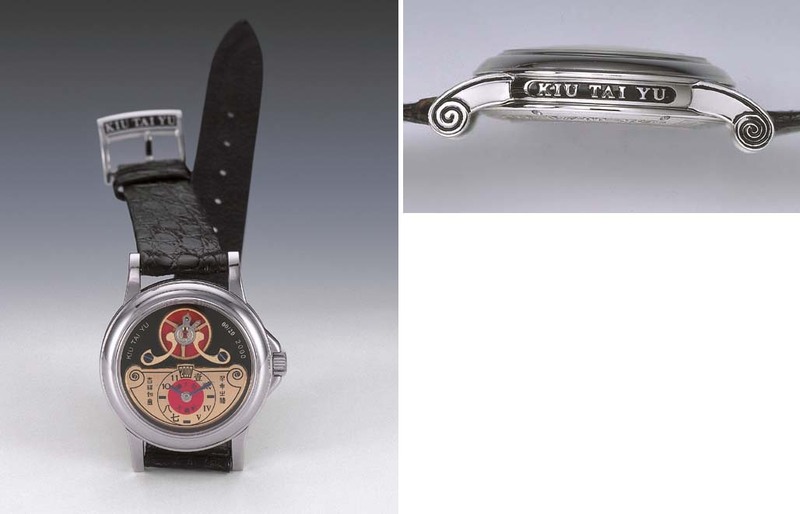 This is the first watch by Kiu Tai Yu to have been sold at public auction.